Update (New Lovers Collection and more diamond models): Casio announced a third Lovers Collection, LOV-18C (right), for a 22 November 2018 Japan release with a list price of ¥47,000 JPY. 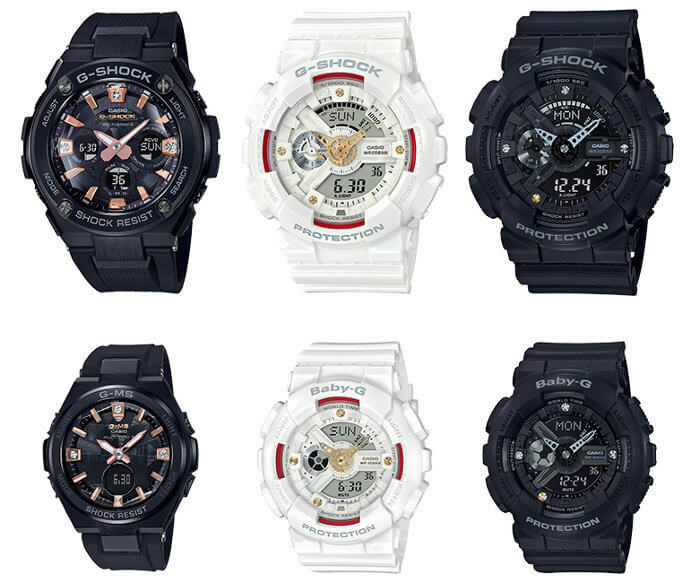 These models with diamond accents on the index appear to be the same as the G-Shock GA-135DD-1A and Baby-G BA-135DD-1A that were announced for Asia and available separately. The LOV-18C Lovers Collection pair must be purchased together as one set and includes special packaging. 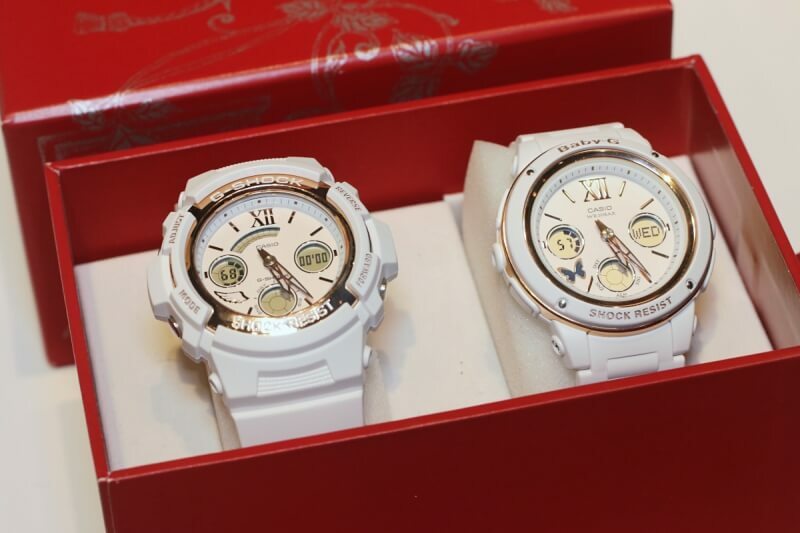 Casio also announced the Precious Heart Selection 2018 (left) with diamond accents which includes the mid-size G-Shock G-STEEL GST-W310BDD-1AJF and Baby-G MSG-W200BDD-1AJF. These watches are available separately for ¥52,000 JPY and ¥35,000 JPY respectively and will be released on 22 November 2018 in Japan. 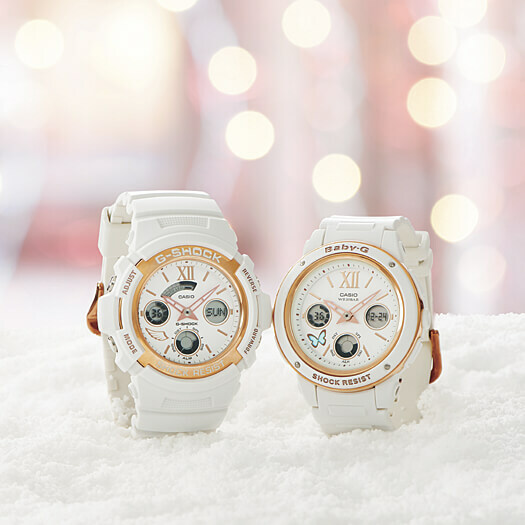 The white G-Shock GA-110DDR and Baby-G BA-110DDR (middle) with diamond accents were announced for a 7 December 2018 Japan release and will be available separately for ¥24,000 JPY each. 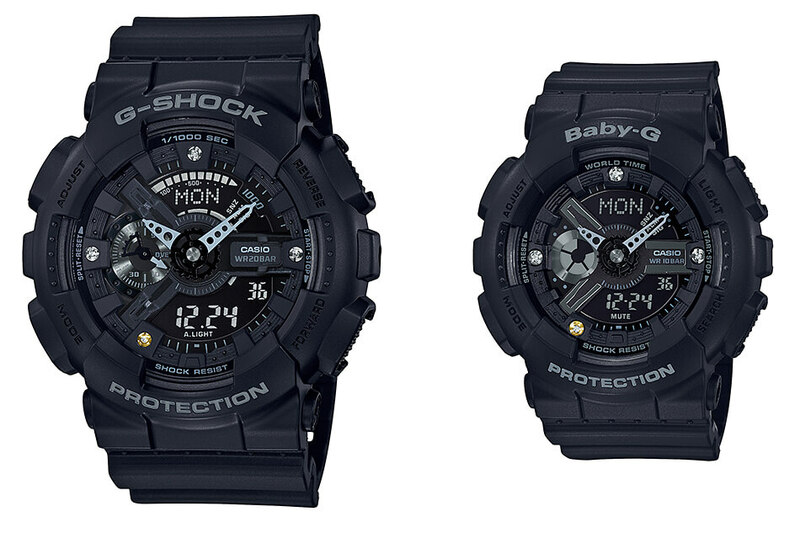 The GA-110DDR-7A and Baby-G BA-110DDR-7A are also listed in the Baby-G Asia catalog. The diamonds on these four models are genuine natural diamonds. 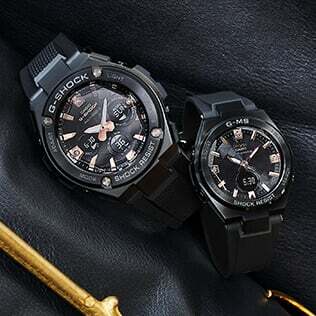 Original Post (First Two Lovers Collections): Casio has revealed the G Presents Lovers Collection 2018 which includes two pairs of matching G-Shock and Baby-G watches due in November. These annual winter limited edition watches have a Greek mythology motif with the theme of “Love is tough” and include case backs engraved with the traditional “angel and devil” motif. The collections include the white analog-digital LOV-18A-7AJR set and the pink digital LOV-18B-4JR set. The LOV-18A-7AJR and LOV-18B-4JR sets have a list price of ¥33,000 JPY and ¥25,000 JPY respectively and include custom limited edition packaging. The watches can only be purchased in the paired sets and not individually. 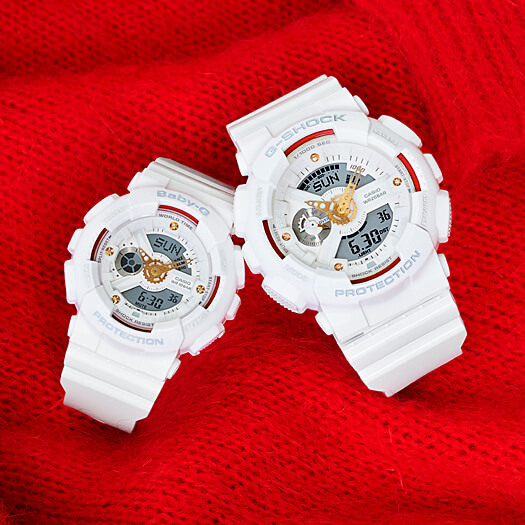 The LOV-18A-7A set includes a white G-Shock AW-591 and Baby-G BGA-150 with the metallic parts treated with a gold IP. The Greek motifs can be spotted at the 7 o’clock position in the form of a feather and butterfly respectively. 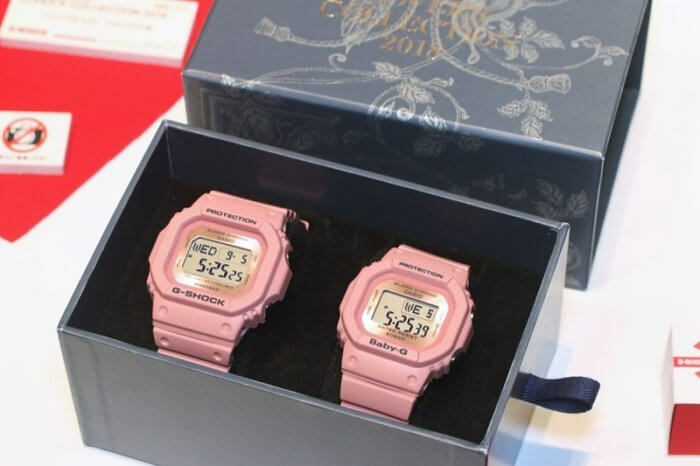 The LOV-18B-4 set includes a pink G-Shock DW-D5600 and Baby-G BGD-560 with what appears to be a metallic mirror rose gold border around the display. The feather and butterfly motif is visible when the EL backlights are activated. This pair has diamonds placed around the index at the 12, 3, 7, and 9 o’clock positions. The diamond at the 7 o’clock position is placed in a gold IP setting. 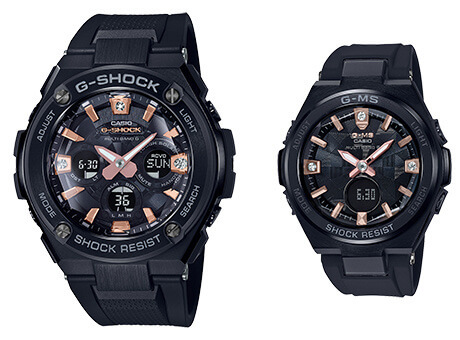 These models have a unique G-Shock and Baby-G case back with the 3-and-5-stars anniversary graphic. The LOV-18C-1AJR set has a list price of ¥47,000 JPY. 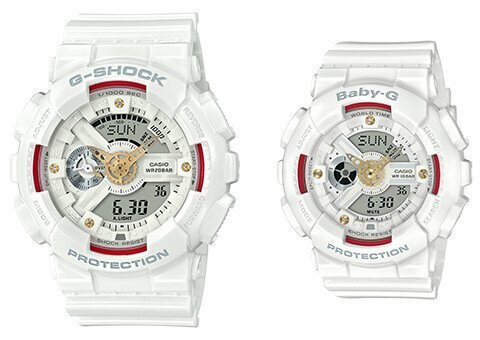 These models are also available separately as the G-Shock GA-135DD-1A and Baby-G BA-135DD-1A in other Asian countries. The G-Shock G-STEEL GST-W310BDD-1AJF and Baby-G G-MS MSG-W200BDD-1AJF are Tough Solar/Multi-Band 6 models with black IP bodies and bezels, resin bands, a rose gold index and hands, and natural diamonds placed at the 12, 3, and 9 o’clock positions. These models also have multi-faceted glass with angled edges near the outer section of the display, which can be seen if you look closely at the photos. The video below offers a closer look at this deluxe feature. The GST-W310BDD-1AJF and MSG-W200BDD-1AJF have a list price of ¥52,000 and ¥35,000 JPY each. There are also Tough Solar versions (without Multi-Band 6) of these watches available in other Asian countries: GST-S310BDD-1A and BMSG-S200BDD-1A. 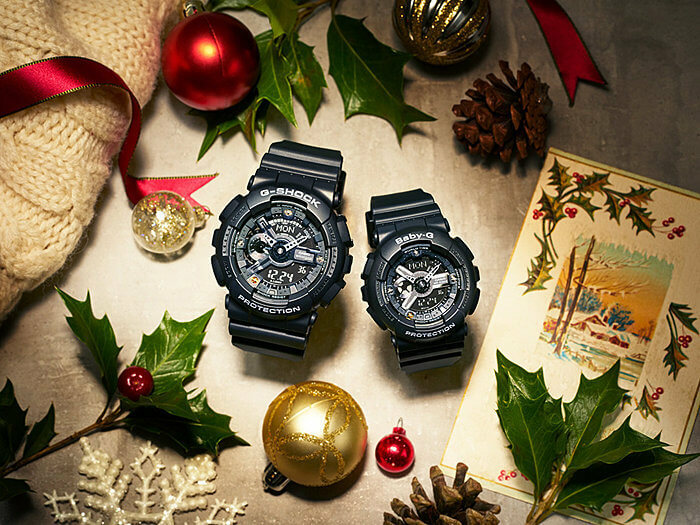 The G-Shock GA-110DDR-7A and Baby-G BA-110DDR-7A complement the black GA-135DD-1A & BA-135DD-1A from the LOV-18C Lovers Collection. Like those watches, the GA-110DDR-7A and BA-110DDR-7A feature diamond accents at the 12, 3, 7, and 9 o’clock positions. Unlike the black series which has a diamond with a gold IP setting at the 7 o’clock spot, this white and red series has a gold IP setting for all four diamonds. The GA-110DDR-7AJF and BA-110DDR-7AJF have a list price of ¥24,000 JPY each. 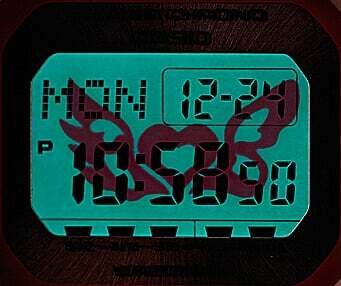 How did that DW-5600 end up with three characters for the day of the week rather than the usual two?